Vehicle ejection accidents often result from the failure of a vehicle passenger or driver in properly using their seatbelt. Other ejections occur when a seatbelt fails or from a defective design in the seatbelt configuration. Ejections occur when0 a moderate to severe impact or rollover collision occurs. The vehicle occupant is then dislodged from his or her seat and out one of the windows or through the windshield. Once an individual loses the protection of the vehicle, they are much more susceptible to significant injury and the possibility of being struck by one of the vehicles. If a vehicle ejection occurs through the failure to wear a seatbelt, the defense can use the negligence of the unbelted occupant against them when they make a claim for damages. If you or someone you love have suffered injuries in a vehicle ejection accident, it is crucial that you consult with an experienced personal injury attorney to help you evaluate the issues affecting your right to compensation via a personal injury or wrongful death claim. These injuries can lead to serious permanent disabilities or even death. 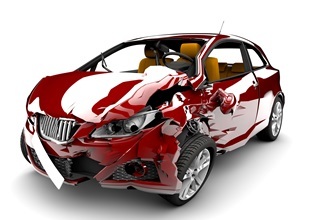 Determining fault for the accident is the first step in any personal injury or wrongful death claim. You can still receive compensation for an accident even if you were partially at fault. However, a settlement or verdict will most likely be proportionally reduced by your assigned percentage of fault. For example, if you were determined to be 40 percent at fault for the accident, you'd only receive 60 percent of the settlement you'd otherwise be entitled to. Even though California has a mandatory seat belt law, failing to wear a seat belt may not bar you from recovering damages, but it will dramatically impact your recovery if it can be proven that the injuries would have been reduced with the use of a seat belt. Experts will be called to examine how seat belt use would have affected the severity of your injuries and your recovery will be adjusted accordingly. In rare cases, a party other than a driver may be liable for the accident. For example, you may have an option for a product liability suit if a defective airbag, malfunctioning seat belt, or faulty tires caused your injury. Personal injury law is very complex, which is why it is in your best interest to contact an attorney as soon as possible. Vehicle ejection accidents can lead to significant expenses, which means a fair settlement is essential to protecting your financial future. There should be no upfront cost associated with obtaining legal representation in an injury case. Personal injury claims can be accepted on a contingency fee basis, which means that your attorney will accept a percentage of the settlement as the fee for his services and will work without cost to you until the resolution of the case. The experienced attorneys at the Inland Empire Law Group can assess the worth of your case, locate documentation to support your claim for damages, line up relevant expert testimony, and negotiate with the insurance company on your behalf. To learn more, call to schedule a free, no-obligation case review. Appointments are available at either our Rancho Cucamonga or Victorville offices.